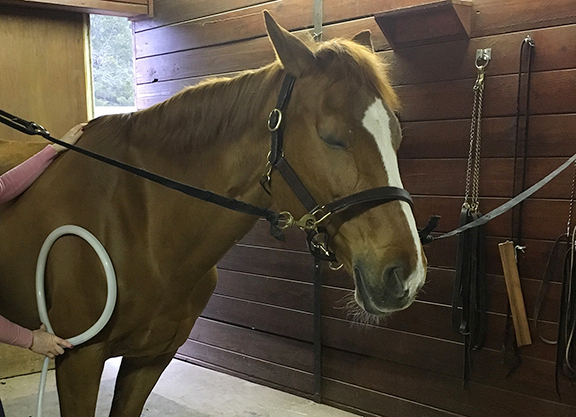 New York State’s Board of Veterinary Medicine stated in a letter in March that use of the pulsed electromagnetic field (PEMF) therapy machine–a popular therapy for racehorses–may only be performed by veterinarians and veterinary technicians. Until now, licensed equine therapists were permitted to use the machine on racehorses at racetracks in the state, as well as trainers who had either purchased or leased the machine for use on their own horses, and these trainers’ employees. The decision has caused concern among a number of prominent trainers and veterinarians, who say that such “holistic” therapies should be promoted for the health and welfare of the horse. “We’re going to go back to the department of education to seek clarification on the letter,” said attorney Alan Foreman, who represents the state’s horsemen, about the umbrella agency under which the veterinary board sits. The letter indicates that use of the PEMF machine involves diagnosis and treatment of illness or injury in the horse, which is why veterinarians and veterinary technicians are only permitted to use them, “and we vigorously dispute that,” said Foreman. In 2006, the NYSGC declined to license Chris Brown, a practicing veterinary dentist for more than 30 years, on the grounds that he wasn’t a licensed veterinarian or veterinary technician. Brown petitioned and litigated the decision, and in 2009, the court ruled in his favor on the grounds that his work as an equine dentist didn’t involve the diagnosis and treatment of conditions requiring veterinary licensure. According to Foreman, he and Dr. Scott Palmer, New York State Gaming Commission (NYSGC) equine medical director, will appeal the board’s decision in the current situation involving PEMF machines. If the appeal isn’t successful, “then I think the next step is litigation,” said Foreman. The TDN contacted Palmer and the NYSGC for comment, but did not receive a response. According to the machine’s manufacturer, a PEMF machine–which typically costs thousands of dollars–is designed to send electromagnetic pulses into the body, stimulating cell metabolism, which in turn enhances the body’s ability to remain healthy and recover from things like fatigue. These machines are sometimes called by the manufacturer’s name, the Magna Wave or the Pulse Center. In New York, the stand-down for PEMF administration is 24 hours before the horse’s post time. According to practicing veterinarian Dr. James Hunt, “there are no side effects” from using PEMF machines on racehorses. “I see it as a worthwhile alternative therapy that certainly can’t hurt the horse, and if you look at the science behind it, I see it as something that helps a horse recover, so why not?” he added. What’s more, the “economics” of the machine, and the manpower hours needed to administer it, means that practicing veterinarians will not have “any interest” in picking up the slack on New York’s backstretches, said Hunt. If veterinarians and veterinary technicians are the only ones permitted to use these machines at the racetrack, “it disappears,” he said. The minimum requirement to become a licensed veterinary technician in New York is a two-year diploma or degree in veterinary technology, followed by the Veterinary Technician National Examination. But trainer Tom Morley said that licensed equine therapists already possess the knowledge and experience necessary to use the PEMF machine safely and effectively. “You’re looking at a group of people who have given up time, put in their money to become qualified to use them and use them in the correct fashion, and effectively, they’ve decided to take these people’s livelihoods away,” Morley said. No other state restricts use of the machine to veterinarians and vet technicians. In California, licensed veterinarians can sign on PEMF machine operators as assistants, provided they get the go-ahead from an official veterinarian, wrote California Horse Racing Board public relations officer, Mike Marten, in an email. What’s more, California-based trainers and their employees are permitted to use it. PEMF machines “are not considered a problem as long as the treatments aren’t performed within 48 hours of racing,” wrote Marten. The decision of the New York state veterinary board hamstrings only a small number of licensed equine therapists–according to the NYSGC website, there are only nine licensed equine therapists in the state. But the ones it does affect will see their livelihoods significantly impacted, said Dianne Volz, who owns Equine Therapy 502, a business that employs two licensed therapists. Veronica Caravella, a licensed equine therapist, said that in late December, she was not issued new credentials by NYRA on the grounds that Palmer, the state’s equine medical director, had, at that time, deemed the PEMF machine a veterinary modality. Caravella said that she was also told that Palmer’s decision stemmed from an incident at Saratoga the prior summer, when a trainer’s employee who didn’t possess an equine therapist license had been found using a PEMF machine on another trainer’s horse.